Diamonds are like graphite, pure carbon, and have been created millions of years ago in intense temperature and pressure in volcanic pipes. 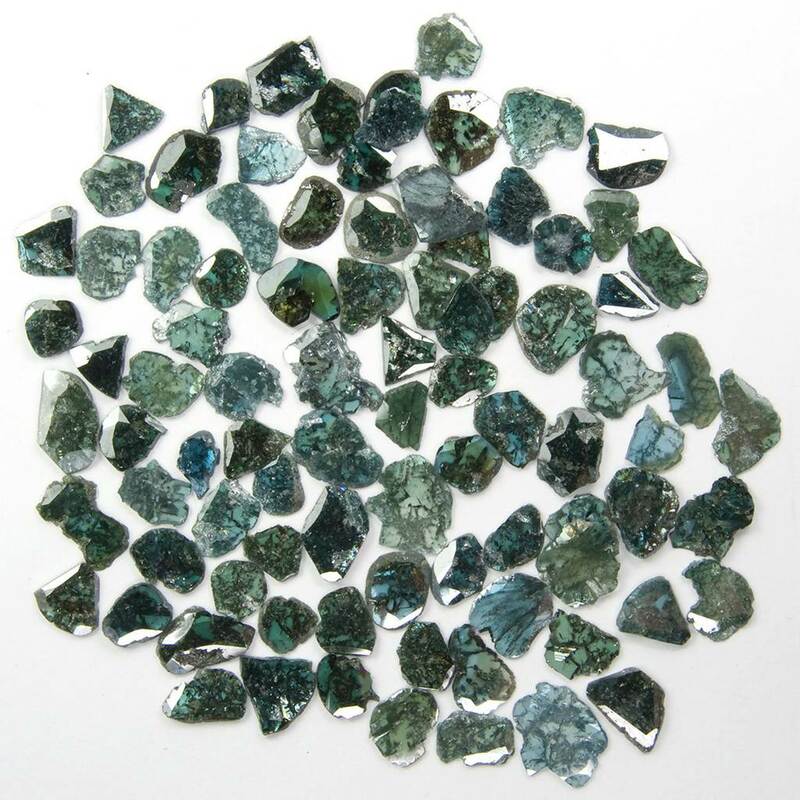 Consequently, most diamonds contain tiny marks, known as inclusions, which make each stone unique. The fewer and smaller the inclusions, the more valuable a diamond will be. But inclusions don't necessarily weaken the stone and its beauty will not be affected if the light is reflected from one facet to another and then back out through the top of the diamond. The skill of the cutter will reveal the hidden fire and brilliance. 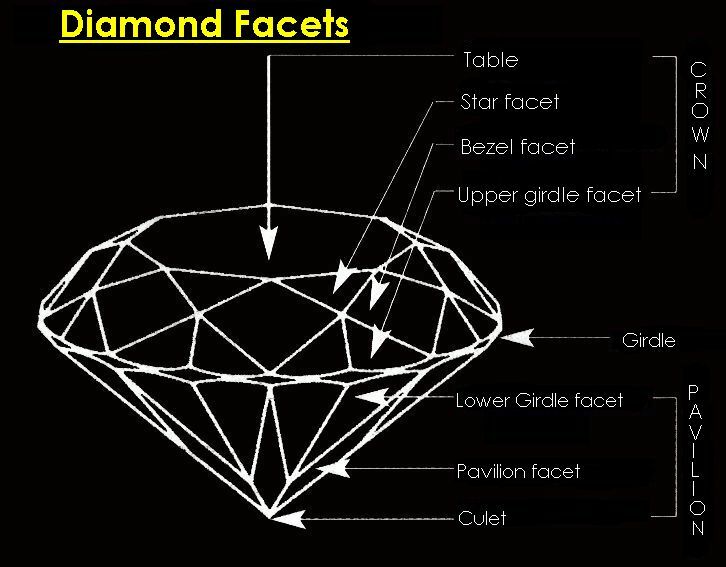 Diamond is the hardest material on Earth and can only be cut by diamond dust and because of the fact that the hardness varies on the crystal facets. 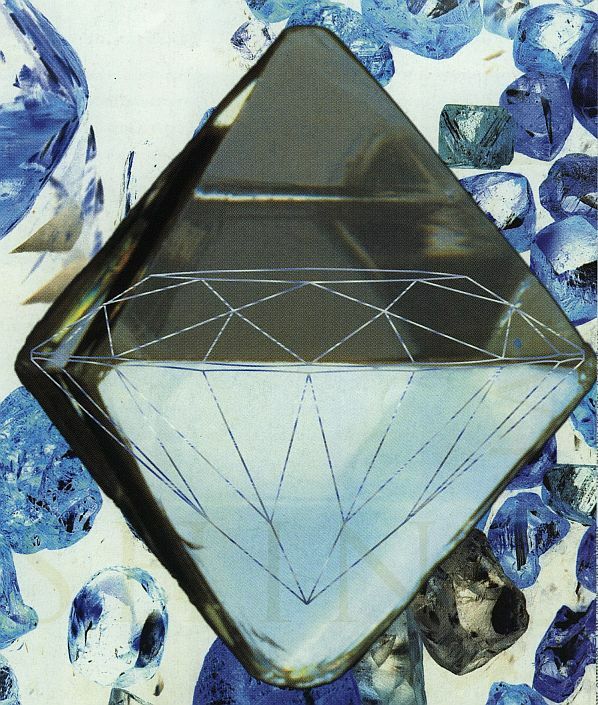 Diamonds are durable and won't deteriorate. A diamond will shine as brilliantly as new each time it is cleaned. In fact it will not be completely dull like glass stones or cubic zirconia, when skin oils, soap, cosmetics and grease have left deposits. You can find information on our website about how to clean jewellery under 'Jewellery Care'. We use conflict-free diamonds with exceptional Russian cut from reliable Australian Suppliers (certificate available) in the quality you desire. 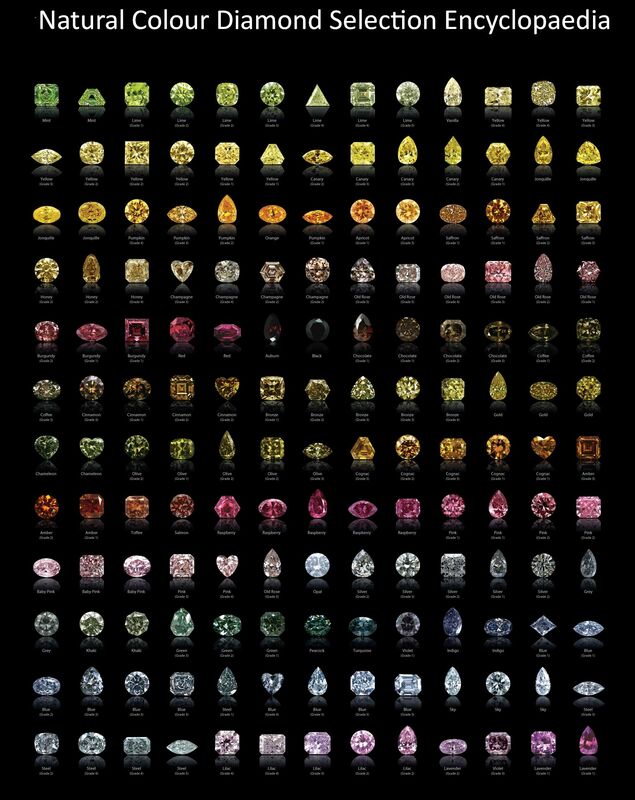 Our suppliers hand-pick the gemstones, which display best brilliance. Their fire and brilliance is unquenchable, which its owner can be proud of. For every carat of rough diamonds recovered, more than 250 tonnes of ore have to be blasted, crushed and processed. Only 20% will be gem quality. 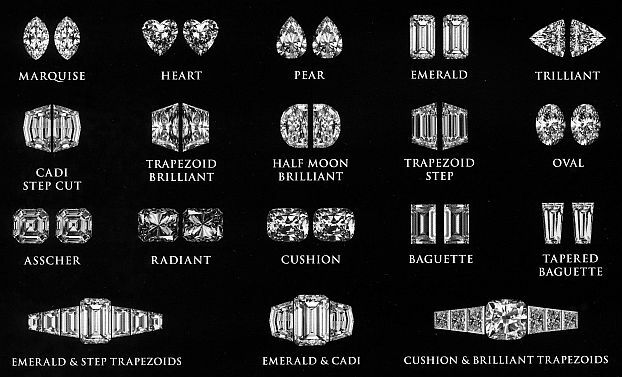 Its value depends on the quality which is determined by carat, clarity, colour and cut. 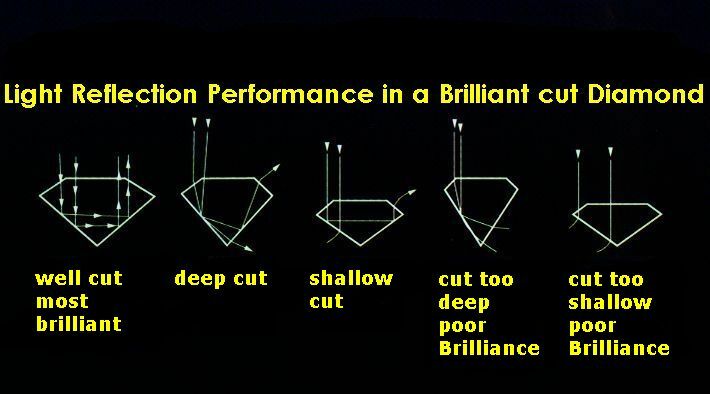 The cut is the most important thing, beside the finish grade (polishing) and the proportions that determine the fire and brilliance (brightness) as shown in the images and descriptions below. ideal Brilliant cut - 57 precisely angled facets offer best reflection and high dispersion of the light causing a colourful sparkling in better quality diamonds. Single cut (Eight facet cut) – usually medium to lower quality small diamonds. Other cuts - e.g. Triangle, Trilliant, Baguette, Baguillion..... as shown on photos. New laser cuts are being developed all the time and have found their lovers, so have coloured Diamonds. means the actual weight of the gemstone. 1 carat is the equivalent of 0.2g and has nothing in common with the 'purity carat' of gold. 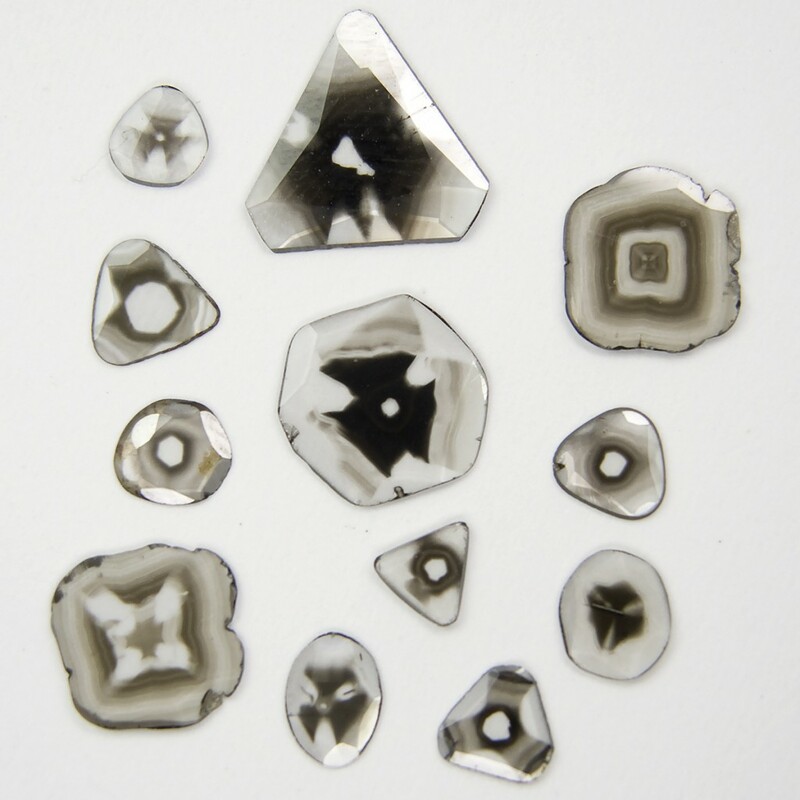 External characteristics on the surface of the stone only have an influence on the clarity grade if they are sufficiently noticeable and if the stone is not internally flawed. 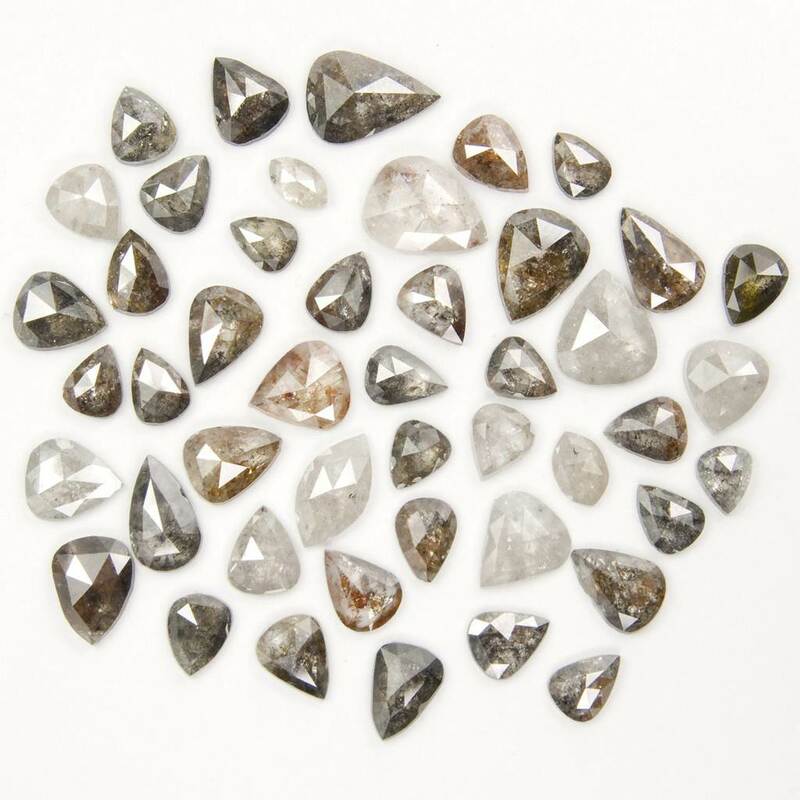 Diamonds with no trace of colour are extremely rare and valuable. Most common Diamond gradation starts going down the alphabet from D (perfect, colourless, rarest and most expensive) to Z (the most yellow) with only subtle differences between the grades. 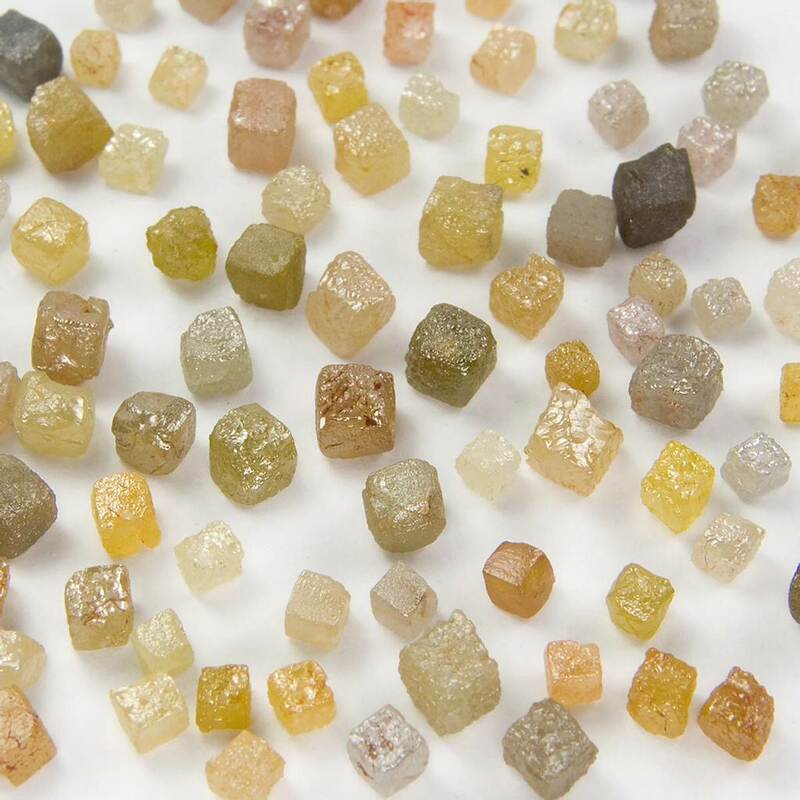 A range of white, rare pink, cognac and champagne coloured diamonds are found at the Argyle Mine in Western Australia. Their popularity and prices vary according to fashion. The champagne colour diamond is the most popular fancy colour. It is actually a diamond that shows various intensities of brown. The International GIA grading scale covers tints of yellow. For brown, a new system – the “C” scale - was developed to accommodate champagne. This was primarily due to the opening of Australia’s Argyle Diamond Mine that produces so many beautiful brown/champagne coloured diamonds. 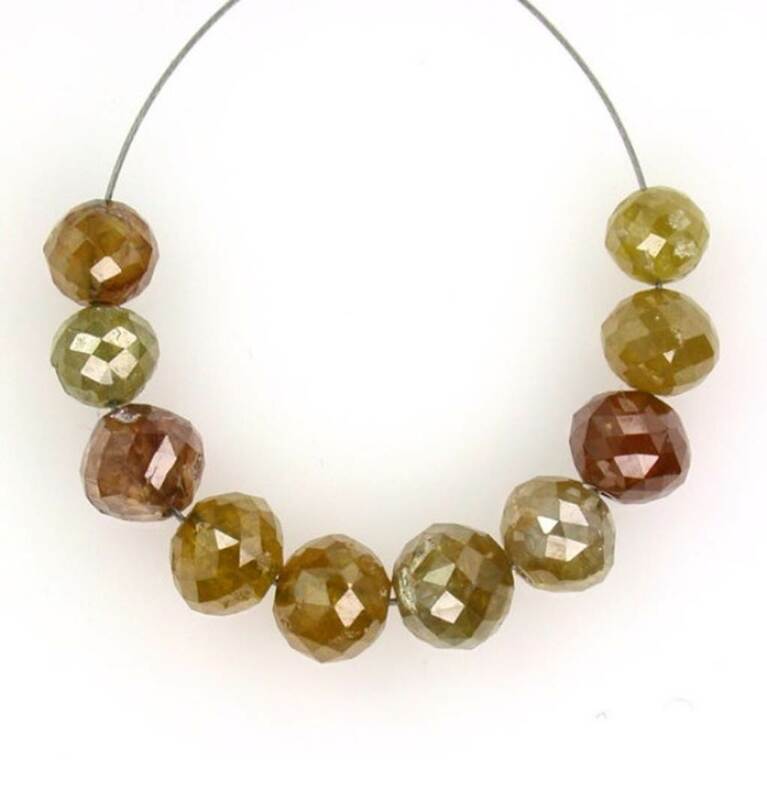 Bezel setting: the gemstone is enclosed in a rim of gold, rubbed over all the way around. For extra sparkle a facet can be cut to the inside of the setting with an engraving tool. Channel setting: a straight or curved open channel of metal walls on both sides with incision holding a row of gemstones set close together. Claw setting: 3, 4 or 6 individual wires in e.g. crown or basket shape are secured to the gemstone by pressing the ends over the stone. Pavé/Grain setting: grains of gold are lifted with an engraver out of the solid metal to raise a bead-like claw securing the gemstone, offering a way of creating bright sparkles from a lot of diamonds placed close together. Buying a diamond means entering an enchanted world of romance, intrigue, legend and history which compared diamonds with tears of Gods or splinters of stars that fell to earth like the Ancient Greeks believed. They were worshiped, sought after, fought over and have become the ultimate gift of love. Cupid is said to have used diamonds as tips on his arrows. To avoid blood diamonds we buy large diamonds with certificate, cut in Russia or from the Australian Argyle Mine. Both suppliers don't support black markets nor child labour. To guarantee conflict free diamonds, they might not be the cheapest, but from legal sources which is providing fair payments for the labourers in the mines. When Princess cut became the latest Fashion, it was sometimes not appreciated, when any good jeweller explained that quality diamonds with brilliant cut have the best fire, because they contain the most facets and are cut to the ideal proportions to best reflect the incoming light, but it is important to mention, because other cuts don't sparkle as nicely and as long, when they become clogged up with dirt. There is another beautiful option to achieve the princess look, we can set a brilliant cut diamond like a princess cut with a square facet cut into the metal around the gemstone and little beads raised in the corners as claws. If you have to budget, our Diamond suppliers make sure, that you get best available quality in the chosen grade, and that inclusions are very hard to spot e.g. only at the edge, which will be covered by the setting anyway. Or you could opt for intriguing new varieties, as shown on the photos e.g. 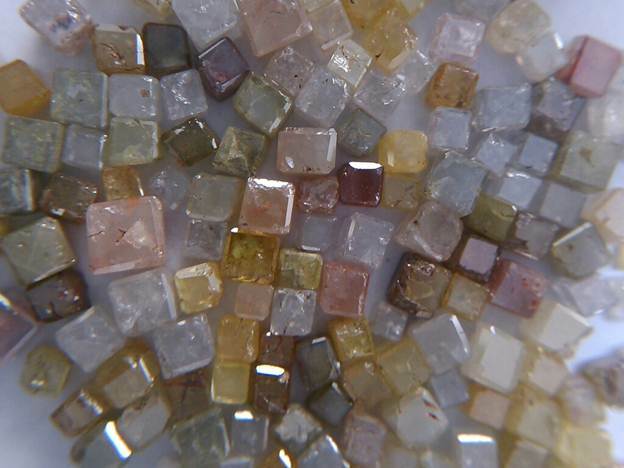 slices, cubes, Briolette Beads, raw, uncut natural Diamonds, yellow or champagne colours.